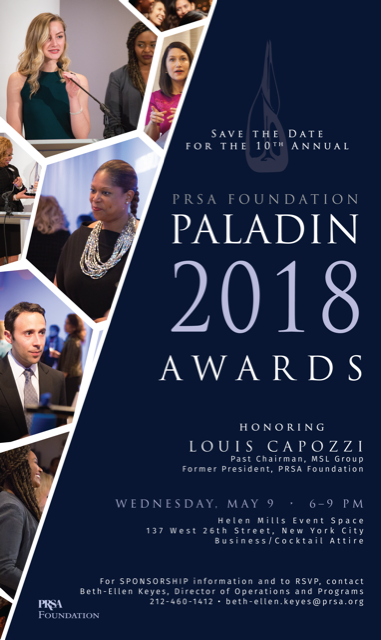 The PRSA Foundation's annual Paladin Award Ceremony brings together leaders from across the Public Relations industry to celebrate the profession and to honor a colleague recognized as a champion for diversity in the field. The PRSA Foundation's mission is to attract and support a diverse range of ambitious and promising students to the public relations profession. Each year PRSA Foundation honors a member of the public relations profession who has made an indelible impact on the community, particularly in the struggle to open the doors of diversity and inclusion for the next generation of public relations leaders. Lou Capozzi has a broad background in corporate and marketing communications. Lou was formerly the Chairman of the MSL Group, one of the world's largest public relations firms, and was Chief Communications Officer at Aetna. A former President of the PRSA Foundation, Lou raised more than $3 million for Foundation scholarships and initiatives. He is now an adjunct professor at the University of Oregon. Working united advances the cause. We're at a defining moment in our industry. Talking about equity and inclusion are not enough. We need intelligent action. That's why I'm giving. I'm honored to support the important work of the Foundation. Diversity and Inclusion are more important today than ever if we are to see our industry reach the heights to which we aspire. It's for PR students, people! And for diversity and inclusion. Open your checkbook and help plot the future of our profession. I support the Foundation's work! The PR COUNCIL is proud to support the efforts of the PRSA Foundation and the Paladin Dinner. Proud to support diversity and the future of the Public Relations profession! I'm happy to support the next generation of PR leaders. Pleased to support the PRSA Foundation's important work.